Managing State in Angular 2 Apps with ngrx/store was peer reviewed by Sebastian Seitz, Mark Brown and Vildan Softic. Thanks to all of SitePoint’s peer reviewers for making SitePoint content the best it can be! The components we build for our web applications often contain state. Connecting components can lead to sharing mutable state: this is difficult to manage and leads to inconsistency. What if we have one place where we mutate the state and let messages do the rest? ngrx/store is an implementation of Redux for Angular, using RxJS, that brings this powerful pattern into the Angular world. In this article, I will introduce the problem of shared mutable state and show how you can solve this using the ngrx/store library to bring the one-way data flow architecture to your Angular 2 apps. Along the way, we’ll build an example app that allows a user to search for videos using the YouTube API. Note: You can find the code that accompanies this article in this GitHub repo. Building components which communicate with each other is a typical task involving state. We frequently have to keep up to date with different Angular components interacting with the same state: when more than one component accesses and modifies that state we call it shared mutable state. To understand why shared mutable state represents a problem, think about a computer which is being used by two different users. One day, the first user updates the operating system to the latest version. The second user turns on the computer one day later and is puzzled since the user interface has changed for no apparent reason. This happened because two users could modify the same object (the computer in this case) without speaking to each other. A common example of shared state is the set of properties of an action we are performing. If we are performing a database search, we call that set of feature the current search. From now on, I’ll refer to such a set as the search object. Imagine a page which allows you to search for something by name, and also offers the possibility to restrict the search by geographical location. This page will have at least two different components that can modify the current search properties. Most likely, there would be a service responsible for performing the actual search. A way to deal with the problem of shared mutable state could be to forward the search object back and forth between components and the service, allowing each to modify it. 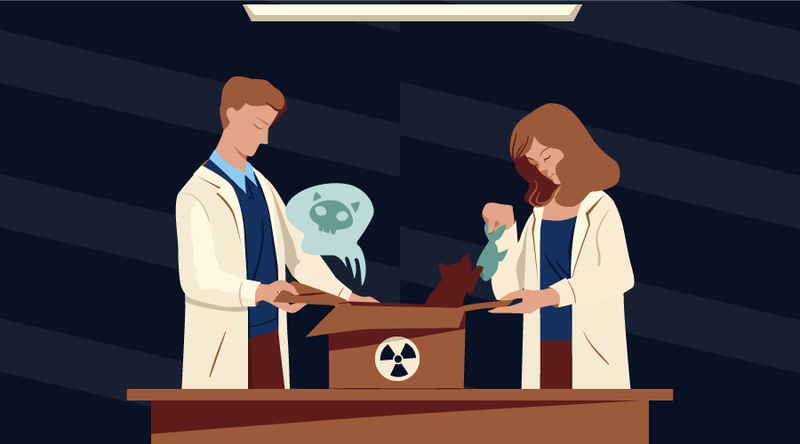 This would entail more verbose and complex testing, which is very time-consuming and prone to error: for each test you would need to mock the object, changing just some properties in order to test just specific behaviors. All these tests and mocks also need to be maintained. Also, every component interacting with the state will need to host the logic to do that. This compromises reusability of components and violates the DRY principle. Quite far from the Single Responsibility Principle, the service has now become the application itself and can’t easily be reused. Even splitting up that service into smaller services will still result in a situation where we have different services or components modifying the same data. Furthermore, the components are consuming the service, thus they cannot be used without the service. A different and often-used pattern is to put all the logic into the application layer, but we’d still end up with a great amount of code in charge of guaranteeing the state consistency. My opinion is that the application layer, which is the real distinctive trait, should only apply the rules. Other tasks, namely message passing, storage, and events, can be handled by the infrastructure. This approach is based on the Flux application architecture model developed by Facebook in the recent years, and on the Elm Architecture. This pattern is also available to AngularJS developers in several implementations. In this tutorial, we will use ngrx/store since it is part of the ngrx package which is the official Angular 2 wrapper for the Reactive Extensions. Furthermore, it implements the Redux pattern with Observables, thus staying consistent with the Angular 2 architecture. So, we can share responsibilities since ngrx/store is taking care of state consistency while RxJS brings the messages bus. Our components will not know about services or application logic: they just emit actions. 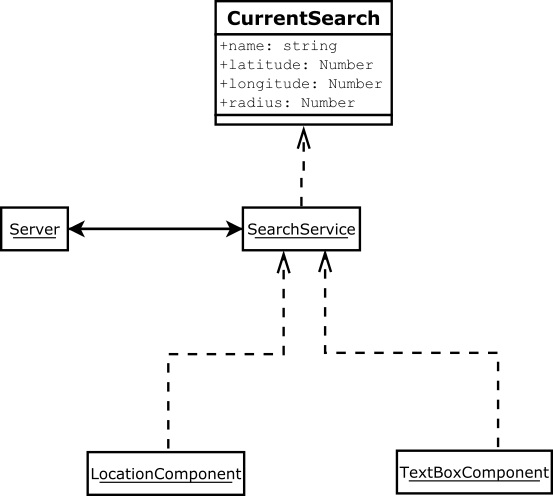 Our service has no state: it just performs a search based on a search object coming from outside. Our application component just listens to state changes and decides what to do. The new entry, the reducer, will actually react to actions, modifying the state if necessary. One entry point for mutations. Now, under the app folder, we create two folders named models and components. The first thing we need to define are the models to be used. Given that a search query is required, we need to decide how to represent it. This will allow searching by name and location. Since the location will be an option, it is defined as an optional property of the search object. A representation of the search result will also be required. This will include the video’s id, title and the thumbnail as this is what will be shown in the UI. This can be broken down as follows: to get an Observable from the DOM event, the helper function Observable.fromEvent(HTMLNode, string) is used to transform the typing into a stream of strings, which is then handled with the RxJS toolkit. Note the definition of store as an input. It represents our dispatcher to deliver the action. The component won’t know about the consumer, the searching process, or the service; it just handles the input string and dispatches it. Pay attention to how the dispatcher is used: Its signature is dispatch(action: Action): void where Action is an object with a mandatory type field (a string) and an optional payload. Since the action’s type is string, I prefer to define them as constants inside the component with a proper namespace so that any consumer of that action will just import and match against them. The logic is still the same: show an input, trigger an action. <input type="range" min="1" max="100" value="50"
It is quite similar to the preceding Search Box component. Nonetheless, the template is different, since now two different inputs have to be displayed. Moreover, we want the radius to be disabled if the location is off. This time, a callback is used, as the data is not like a stream of numbers, but a single event. Finally, the handler for the radius is added, just dispatching the new value regardless of the location’s status since we have the disabled attribute working for us. This is, together with the dispatcher, the core of the new system. A reducer is a function which processes an action and the current state to produce a new state. An important property of reducers is that they are composable, allowing us to split the logic across different functions while keeping the state atomic. Because of that, they need to be pure functions: in other words, they have no side effects. This gives us another important corollary: testing a pure function is trivial since given the same input will produce the same output. The first action we must handle is the non-action: if the action doesn’t affect the state, the reducer will return it unmodified. This is very important to avoid breaking the model. If the action is the one exposed by the SearchBox component, we know that the payload contains the new text. So we need to modify just the text field of the state object. As per best practices, we don’t mutate the state but rather create a new one and return it. At this point, we have two components dispatching actions and a reducer to handle the messages. The next step is to wire up all the elements and test it. We then need to provide a store which will take care of dispatching actions and run the reducers against state and actions. This can be created using the provideStore function of the StoreModule module. We pass an object with the name of the store and the reducer handling it. Here, we’ve defined a private property which represents the state to expose (for the UI). 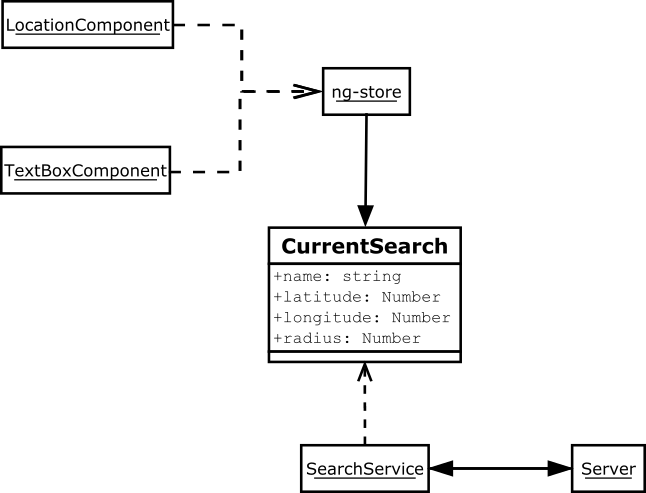 The store service gets injected into our constructor and used to get an instance of currentSearch. The OnInit interface is used to get the hook for the init phase, allowing the component to subscribe to the state’s updates using the store’s instance. Now a simple service can be implemented which accepts a CurrentSearch and calls the backend API (could be YouTube, for instance) like in the live example. One could change the service, without changing a single line of the components or the application’s implementation. 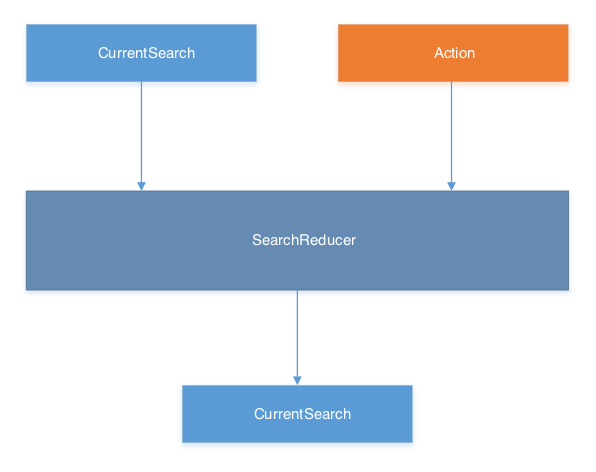 Furthermore, ngrx is not limited to the store: several tools like effects and selectors are available to cope with more complex scenarios, like handling asynchronous HTTP requests. In this tutorial, we have seen how to implement a Redux-like flow in Angular 2 using ngrx/store and RxJs. The bottom line is that since mutations are the root of a lot of issues, putting them in a single, controlled place will help us write more maintainable code. Our components become decoupled from the logic and the details of their behavior are not known by the application. It’s worth mentioning that we’ve used a different pattern than the one shown in the official ngrx documentation, since the components are dispatching actions directly, without the use of events and an additional layer of smart components. The discussion about the best practices is still evolving. Have you given ngrx a try yet, or do you prefer Redux? I’d love to hear your thoughts! Just a web developer with strong 3D graphic skills, and four years of experience as 3D artist: my first professional work as a developer involved WebGL. I like studying new technologies and sharing knowledge through my blog. I'm passionate about language learning, be it a human or computer language.